Here’s one for every tired of seeing all the stainless steel appliances out there today. 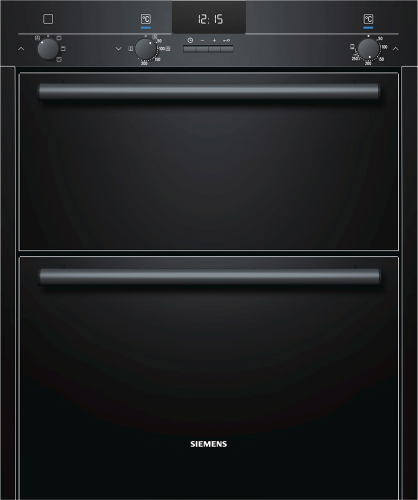 The HB13NB621B is a beautiful full black built-under double oven, with visual appeal worthy of even the fanciest of designer kitchens. For those wondering, built-under means that this oven goes underneath your worktops rather than in a tall unit as is pretty much the standard in modern kitchen design. If you wish to stand out from the crowd then this is one great way to do it. The actual finish is lacquered metal which looks absolutely fabulous. All control dials are black, the inside is black, the door is black. Everything is black. The only thin that isn’t black is the LCD display and the icey blue LEDs which indicate the various functions; to be quite honest this oven looks like something out of a sci-fi movie. We love it. All the handles are black, as are the controls. Let’s not go too crazy here, but I want to get the point across that this thing is a really sleek piece of kit. Once you see and experience the colour of this thing, you’ll wonder why manufacturers have taken so long to produce appliances in this style. To put it bluntly, you’ll never go back.